EPA has released a new online training module, “Understanding Climate Change Impacts on Water Resources.” This training module is intended to increase water resource professionals’ understanding of the causes of climate change, its potential impacts on water resources, and the challenges that water resource professionals face. The module also describes how federal, state, tribal, and local governments and communities are working to make the United States more resilient to the impacts of climate. 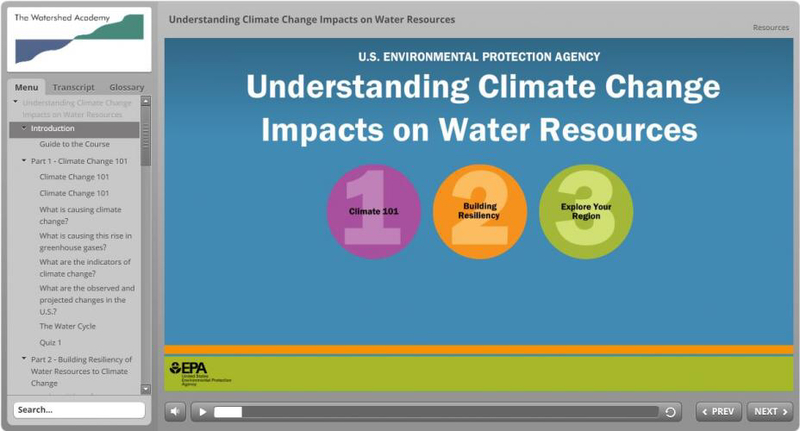 The 45-minute training is part of the EPA Watershed Academy Web certificate program.The training module is designed to increase your understanding of the causes of climate change, its potential impacts on water resources, and the challenges water resource managers are facing. The course contains three parts which will take about 45 minutes to complete. Optional supplementary information on climate change impacts in the United States is included at the end of the course if you are interested in more details. Visit EPA Watershed Academy for more information and to start course. You can also view and download the course transcript here.